In the early 1820’s, LaGrange was established on the crest of a mountain near Leighton, AL. Initially there were about 400 inhabitants. In the late 1820s, the Tennessee Conference of the Methodist Episcopal Church solicited proposals for a site and subscription of $10,000. On December 4, 1828, the Methodist Church accepted the LaGrange proposition. Later that month, the Mississippi Conference joined in the efforts to establish a college. 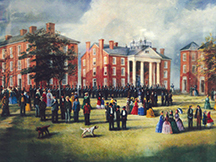 Representatives from the two conferences met at LaGrange on January 10, 1829, and selected a site for the college. On January 11, 1830, “LaGrange College” opened with an enrollment of 70 students, becoming the first state chartered college in Alabama. Rev. Robert Paine was the first president (1830-1846). The enrollment peaked at 139 in 1845. Dr. Richard H. Rivers became president in 1854, when the college faced serious financial problems. In response to an offer of better support, Rivers moved the college to Florence, Alabama in January 1855. Over 150 graduates received degrees during its 25-year history. 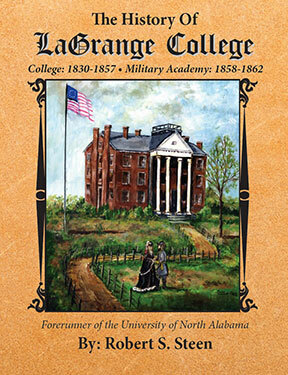 The establishment of LaGrange College in 1830 should be considered the birth of collegiate education in Alabama. The move to Florence was controversial, some students and faculty remained at the former campus, and the Florence institution was denied permission to use the name of LaGrange College. It was chartered as Florence Wesleyan University on February 14, 1856, and is known today as the University of North Alabama. After LaGrange College moved to Florence in January 1855, a group of LaGrange citizens reorganized the college in the vacant buildings under the old name. Rev. Felix Johnson was elected president. To increase the patronage, a military feature was introduced in 1857. Major J.W. Robertson became superintendent, and classes were suspended while a third major building was erected for the cadets. The college reopened in February 1858, as LaGrange College and Military Academy. The new institution’s financial situation was dismal until the State of Alabama provided military equipment and scholarships. The Academy soon flourished and became known as the “West Point of the South.” In 1860, the name was changed to LaGrange Military Academy. By 1861, the enrollment was almost 200 cadets. During its existence, 259 cadets from nine states attended the Academy. In 1861, many LaGrange cadets left to join the Confederate Army. Consequently, the Academy was forced to suspend classes on March 1, 1862. Only two cadets had graduated. Major Robertson was authorized to organize the 35th Alabama Infantry Regiment, C.S.A. He was elected colonel and the remaining cadets formed part of one company. The regiment was mustered into the Confederate Army on March 12, 1862, for three years. On April 28, 1863, the 10th Missouri Calvary of the Union Army, known as the “Destroying Angels,” commanded by Col. Florence M. Cornyn, burned the Military Academy, the nearby La Fayette Female Academy, many businesses, and homes. The village of LaGrange dwindled away. In 1995, LaGrange Park was transferred from the Alabama Historical Commission to the LaGrange Living Historical Association. Thereafter, the site of Alabama’s first chartered college was enhanced and stands today as a historical landmark. Listed on Alabama Register of Landmarks and Heritage in 1976.